by Chris Gosselin, Boston, MA. Promoting the love of literacy in your classroom can be hard enough contending with new curriculum, reluctant readers and not enough time. Luckily, effectively integrating digital tools can be a big help. In a technology-rich classroom environment, we often forget about how devices and online tools can support our work as literacy-focused educators. Below are some ideas on how to quickly and meaningfully integrate technology into your classroom. Some of the best digital tools are right at our fingertips and we don’t even realize it. Take the camera on an iPad or Chromebook, for example: it is a seriously powerful tool. Coupled with an app, or even just on it’s own using the native camera app on the device, the camera allows for kids to share their reading from their perspective. Teach K-2? Check out Seesaw. It’s an easy to use tool that allows kids to share their voice in fun ways: text, pictures, drawings, audio and video. There’s even an easy way to set up a class blog (where you, the teacher, control what is published for each child) that can be shared with parents and community members. Seesaw is supported on iPads and Chromebooks and is super easy to set up and use. During independent reading, students could have access to a device to record their thoughts and reflections on the class Seesaw stream. This past summer, FlipGrid overwent a massive upgrade that, most importantly, made it free to all teachers. FlipGrid is a phenomenal, web-based tool that allows teachers and students to build communities centered around video clips. For kids and teachers, FlipGrid is easy and an absolute blast, and has a remarkable community from all around the world ready to offer tips and tricks as you roll it out. Want to get started promoting your students’ voices? Set up a “recording booth” near your classroom library where students can review books or make recommendations for their classmates. Or, next time you confer with a students about what they are reading, bring an iPad or Chromebook along and record the conversation. Both Seesaw and FlipGrid make it easy to build libraries of videos that you can reuse throughout the year. You could even share videos between classes to help build a culture of readers in your grade level. Right at your fingertips, you have the ability to easily build and curate student-driven portfolios chock full of products of learning to share with other teachers, administrators and parents. Create a Google Slides deck and share it with your class on Google Classroom. Over the course of a day or two, invite your students to create a one-slide review of a recent read. When the slide deck is completed (don’t forget to add your own review! ), invite your students to read each other’s slides and encourage them to comment on each other’s work. Next steps could include sharing the Slides deck with another class, families or with a “pen pal class” at another school. This is an easy way to encourage kids to start a dialogue about what they are reading using a medium they are comfortable with. Perhaps the Slides could then be projected at lunch in the cafeteria, or at an all school meeting. Or, during a guided read-aloud, some students could be designated as “note takers” and record thoughts and questions that are brought up by the class, and record them onto a shared Google Slide deck. Ready for the next step? Twitter is brimming with amazing teachers and learning communities from all around the world that want to share their love of literacy. With the appropriate permissions in place from your students’ families and your administration, start connecting your learning community with others from around the world. Start exploring hashtags such as #elemchat, #edchat or #literacy to find like-minded educators. Don’t be afraid to reach out and connect with someone! Unfortunately, right now in our society, Twitter gives many a bad taste in their mouth. It’s up to us in the field of teaching and learning to claim it back and share how powerful of a tool it can be! Instagram is growing in popularity as the go-to tool for teachers to share the learning happening inside their classrooms. Because so many parents are active on the image-sharing platform, it’s a great way to connect your classroom with the world. Before diving into any social media tool, be sure to confirm permissions with your administration. Partner with your principal or digital learning coach to make sure you are using social media responsibly, safely and in compliance with your district’s policies. I am blown away by the amount of care and effort teachers put into curating classroom libraries. One of my favorite things to witness at my school is a child weaving their way through well-stocked bookshelves, searching for the next great read. There are some really useful ways that technology can help us organize and promote our libraries, starting within our own classroom. QR codes are a surprisingly easy way to organize and share information in our classrooms. A QR code is a square, unique image that acts as a shortcut. By scanning a QR code using a device, users are quickly directed to a website chosen by the creator of the QR code. Perhaps QR codes could be pasted on the back cover of a book, and when scanned, students are brought to a website containing a book review written or recorded by a peer. Or, maybe a QR code posted on a bookshelf leads a student to a blog post or website that describes that section of the library. The best part? Students can easily create content that can be shared with QR codes. You can create QR codes easily on a website or with an app, depending on your device. For older (and more organized), try using Google Sheets to create a record of books in your library. Some of your “type a” students might really enjoy the task of organizing and entering data about your library into a spreadsheet, and then, might even enjoy creating charts and graphs that show how often the book is read, how many titles in each genre, etc. It’s never too early for kids to get their hands on a spreadsheet and to start exploring the powerful data-focused tools that they contain. In 2018, our students are better equipped to tackle the challenges of the world in which they live if they have experience writing for an audience online. When scaled appropriately based on grade level, blogging gives students the opportunity to develop and craft their voices as writers and contributors to a community. Whether the blog is designed and maintained within your classroom walls or shared with the world, online writing provides students with a real-world experience. All great literacy curriculums encourage students to “write to text” regularly in order to strengthen and flex their reading muscles. By drawing conclusions and making connections, students who write about their reading are actively flexing their “reading superpowers”. When we write about what we read, we give students the opportunity to develop their voice as a critical thinker and evaluator of text. Most importantly, students are encouraged to actively share their voice with their learning community and beyond. Literacy and digital tools, when partnered together in meaningful ways, are more powerful together than apart. As we embark on the new school year, keep these strategies in mind as you couple your literacy-rich classroom with the powerful, digital learning tools available to you at your fingertips. I want to share with you that starting in September, I’ll be serving in a new role in the Wakefield Public Schools. As the Digital Learning/Media Specialist at the Dolbeare and the Walton, I’ll be able to share my love of instructional technology and literacy with teachers and students in exciting new ways. If you’ve had me in class (which I assume, if you are reading this, you have), you know my mantra, my saying, what I live by when I step into 1223 every day: YOU are the most important people in the room. You: the singular: the learner, the questioner, the visionary – YOU are the most important PERSON in the room. You: the plural: the community, the class, the team, the ensemble, the SQUAD – YOU are the most important PEOPLE in the room. Continue to work with each other. Continue to lift each other up when things get messy. Continue to support, to help, to praise, to question, to celebrate each other. Remember: you are always welcome to get in touch. I want to catch up with you and hear how things are going. I’m just a mile down the road at the Dolbeare or at Walton. I already told my new principals that I can’t wait to get high school students involved in our elementary learning communities. That’s a priority for me, so when I get in touch, you better answer! Thank you, students, for making me a better teacher. One of these things is not like the other… or are they? More so than any other year, I’ve noticed my students using Snapchat to communicate with their friends. In some education article or another, I read recently that using Snapchat could actually be the most authentic form of communication that today’s teenagers employ: no text, no room to subtweet, barely any time to establish tone, just a simple picture (usually a selfie, and usually with a weird face). Many of my colleagues scorn this behavior. “It’s destructive.” “It’s distracting.” “Their just sending inappropriate pictures to each other.” To be quite honest, I’m really sick of the “lock-it-down” mentality when it comes to tools that help student connect with the world in which they live. Really? It’s 2016. Instead, I think it’s about time that we start to find ways to leverage this desire our students have to be immediately connected to those around them. I want to focus for a minute on the word “leverage”. I feel like I hear it used a lot in the my circles of education: “leveraging student success”, “leveraging faculty engagement”, so on and so forth. When I hear the word, I appropriately think of a lever. I think of a mechanism. An action. Something that pushes something else over the edge, shifting the weight. When I really consider it, I am genuinely interested in the power of a lever in my craft and discipline. Why? It can do great things. And most of the time, it’s already in place. We just need to find the means/urge to push it so it helps set positive force into motion. I recently led a PD session in my district that I called “Creating a Culture of Connectivity.” Honest moment: I liked the alliteration. Another honest moment: I came up with the title an hour before I presented. However, I didn’t recognize the power of the title until I was knee-deep into the second of three sessions that I was leading that day. I was surrounded by colleagues: some I had met just that day (from another school in the district), and others I had worked with for several years. I had planned the session to just hit on a few tech tools that I had found useful, but I found myself talking about ideas I hadn’t planned on. Don’t worry… this post isn’t going to turn into some sort of a testimony about how I was moved to speak in tech-tongues (that would be cool), but I will say that I felt eerily comfortable sharing a potentially-dangerous idea with my colleagues: if we, the teachers, aren’t ready and willing to go to places outside of our comfort zone, how can we expect our students to be? I provided some guidance for my students, namely in how I wanted them to share this information with me: Padlet Backpack. I’m a huge fan. I use it all the time. I wrote about it last month… check it out here. My students know that they can use text, video, images, a slideshow, you name it to convey their review. They know the task, I provided a framework, they leveraged the tool to make it their own. As the students go to task, I purposely gave minimal direction in order to see where they would take it. Guess what? Are you ready? They wrote words. That’s it. Even with my prodding, not one student was brave enough to record a video of themselves talking about their text. They all put a picture of (mostly of the book cover) but only did that because I told them too. I was so frustrated. The bell rang, they left seemingly unaffected by what I thought was an amazing lesson, and I sat alone at my front table and stared at the back wall. As a teacher-learner, I’m curious about why my students will post videos and pictures of themselves on a social-media service to send to their friends, but will refuse to spend thirty seconds recording themselves talking about a book that they liked. I’m almost certain that there is an anxiety associated with this task: they don’t want to appear “uncool” by recording a video or themselves talking about their book, or creating an infographic. So, here’s where I’m at: I want to challenge the norm that Snapchat (or other instant photo-sharing tools) are bad for kids. Sure, students use them inappropriately all the time. I think that it’s our responsibility as technophile teachers to teach, model and show students how these tools could and should be used to further connect them to their world, in a language that they are already fluent and comfortable speaking. I look forward to the challenge of continuing to craft a culture of connectivity in my classes. This post was originally published on my co-authored blog: fortheloveofreading.org. We’ve all been in a class of some kind (professional development, undergrad, graduate) where the instructor hands out sticky notes and asks you to write down a quick response as a check for understanding. In my experience, I’ve had to do a variety of things with this sticky note, including but not limited to: post it on the board, put it on my forehead, post it on a peers forehead, crumple it up and throw it to a random person across the room, etc. The conceits of this tried-and-trusted teaching strategy are no-brainers/important buzzwords: check for understanding, making connections or formative assessments. You get the idea. Teaching 101: student responses frame instruction, in the short-term or the long-term. We English teachers especially love these kinds of strategies. An essential component of our curriculum (although, unfortunately one that is the first to get the chopping block when we get swamped) is the incorporating the reflective practice. As I tell my students, reflecting is a natural, human being thing that we all need to know how to do in order to be successful. In order to be a real person, you have to know how to take in information, consider how you feel about it and then tell someone about it. Wash. Rinse. Repeat. But what if we took this to the next level? Are there ways to extend these reflective moments within our practice? Can we make them even more of a natural part of our teaching using a digital learning tool? I’ve had a lot of success with a tool called Padlet this year. I first heard about it at a conference a few years ago, but never got around to trying it. To be honest, I first associated it with a more elementary level teaching tool (don’t ask why, I can’t remember), but over the past year as I’ve played around with it, I’ve quickly figured out that this tool could be an essential part of my arsenal of digital learning tools, especially in an ELA classroom. In this example, my students used Padlet to share how they thought Rebecca Skloot, the author of The Immortal Life of Henrietta Lacks, used primary resource devices to enhance the storytelling. In my classroom, Padlet has become an essential part of the digital learning landscape. In a flash, students can access my Padlet domain (they have it bookmarked) and can easily add their thoughts to Padlets large and small. I teach my classes in reading groups (students are grouped in fours or fives at all times – inspired by @msbethhughes), so Padlet allows for me to quickly formatively assess my students and the work they are doing in their groups. Plus, it easily allows for me to see where the whole class is at. Students will often discuss something in their small groups and then add their observations/writing to the Padlet so the whole class can see. I’ve used Padlet in my classes for art critiques, thesis statement sharing, research collaboration and creative writing. You might be thinking: “this all sounds great, but haven’t you heard of a Google Doc?” Yes, the products created in Padlet could be created in a Google Doc, but in Padlet, the interface and ease of use gives the students a more streamlined and accessible experience. User management: you can easily create usernames and passwords (don’t worry, you can do this in batches. You don’t have to give up your Saturday) so the experience is more secure and organized for your students. Privacy: your Padlets are automatically private, and only live within your domain. Customization: Backpack allows for you to customize your Padlets with your own logo (for the brand-concious teacher) and even your own custom domain. Mine is mrgosselin.padlet.org, which is very easy for my students to remember. Analytics: you can check to see if and when students accessed the Padlets you create, to appease the the “big brother” in you. I don’t work for Padlet. Really. If you haven’t checked it out, I say go for it. The more tools we can leverage for student response, the better. Our students are better for it and we are stronger teachers because of it. If we aren’t finding ways to be responsive in our teaching, we are doing our craft, and more importantly our students, a disservice. Fantastic post from my colleague, Beth Hughes! Teaching is a lot like childbirth. If we told teachers-to-be the truth about their futures, education majors everywhere would take their college loans and head for the hills. I heard these same euphemisms as my cape-clad self sauntered into my first classroom. In those early years, the only time I took off my pinkish-hued spectacles was to polish them. Pollyanna or not, I entered teaching to inspire young minds. I’m happy to share this piece written by a former student, Shannon Quirk. Shannon is a first-year student at Assumption College. She recently sent me an email telling me how different the use of technology is at the college level, so I asked her to write a post to share with you! As we continue to develop our BYOD program at our school, I hope that Shannon’s voice can be heard loud and clear. It’s one thing to provide resources for our students, but completely another to promote a culture of self-reliance within our student body. Check it out below, and thanks Shannon! Starting college has been a challenging task for many students over the years as they are faced with many changes: moving away from home, making new friends, gaining more freedom, adjusting to a new learning environment, and the use of technology in their learning. Thankfully, in the 21st century students no longer need to include the incorporation of technology on the very long list of changes and challenges they face. Graduating from Wakefield Memorial High School in 2015, I was much more confident in my technological ability than any class from WMHS had previously been. Junior year of high school, I was part of the piloted BYOD (Bring Your Own Device) program, and later was part of the first class at WMHS to incorporate technology everyday into the classroom. As with many new programs, at times there were challenges. Teachers and students struggled together to find a way to incorporate technology into the curriculum in a meaningful and effective way. However, by the time graduation came around, the teachers and students in my perspective had figured out the “new norm” in the walls of Wakefield Public Schools. As I am half way through my first semester of college, I have taken some time to reflect how Wakefield’s incorporation of technology has prepared me for college. While walking around campus, you are constantly seeing technology everywhere. Whether it’s the cafeteria, library, student center, or the classroom, computers are everywhere. In high school, teachers would often say “take out your devices” in college that does not happen. If you want to take notes by hand then you can, and if you want to take out your computer to take notes, that is also welcome. Students in college have a lot more freedom when it comes to their use of technology. However, certain professors in college do have specific requests when it comes to papers. In Wakefield, teachers had students use Google Drive. In college, many professors request the use of Microsoft Word. It has been a little difficult getting used to the new formatting that this different app offers. I wish that prior to college I had some experience in many other applications, while still becoming experienced in Google Drive. One major change I have experienced in college, is taking exams. When taking exams, students take out their laptops, access Blackboard (our schools online academic resource) and take the exam fully online. In high school, some of my teachers started to offer portions of exams online, however this was very minimum. Taking an exam online is different. Many of the strategies I used to use while taking an exam on paper, are no longer usable. There are new exam strategies for taking exams online that students should become aware with. Technology is now a key element of undergraduate learning. It is important that students are comfortable and knowledgeable with technology. In high school, teachers were very understanding when students came in with paper copies because they could not figure out how to turn in their papers via turn it in or google Drive. In college, professors do not care if you had computer trouble, if the paper was due and you didn’t turn it in, then it is a zero, computer trouble or not. I personally believe that students at WMHS would benefit from the teachers being stricter on deadlines especially when technology is involved. It is the student’s responsibility to get their computer fixed prior to class, and their responsibility to ask for help outside of the classroom environment if they are having issues with their devices. In my experience at WMHS, I often received too much help when it came to using devices in class. Teachers provided step by step directions for turning in papers, logging onto Drive activities, researching articles online, ect. I wish that I had become a little more independent when it came to my use of technology. In college you are on your own, your professor is not going to help you with your computer or give you step by step directions when asking you to go online. Lastly, one major change I have faced is the use of online textbooks. Prior to college, I had no experience with online texts. It is my understanding that online textbooks are very expensive, so it is understandable why public high schools are not using them. However, in college just about every class requires students to purchase an access code for an online text. I think that reading from a paper book, is very different from reading from online text. Taking notes is also different. I was not prepared for this big change, as I have always had paper texts throughout my education. Overall, I believe Wakefield did prepare me for the use of technology in college. However, I do believe that Wakefield Public Schools can continue to improve their advances in technology to make students even more prepared. I am learning in college, that the professors like to stay up to date with all the new technological advances. It is important for Wakefield to stay ahead of technology, so students will be prepared to learn new technology as it advances. An over-abundance of good: using multiple tools at once. Integrating multiple tools at once can be challenging. I’m guilty of band-wagoning. Yup. I admit it. A new tech tool comes out, and the next thing you know, Mr. G is trying it out in his next class. Literally, my next class. I can’t imagine this is healthy for my students’ learning. We all get excited and like to try new things, but the reality is it might not always be the best for the students sitting in front of us. Here’s something to think about: what happens when we have several really good tools that we want to work in unison? 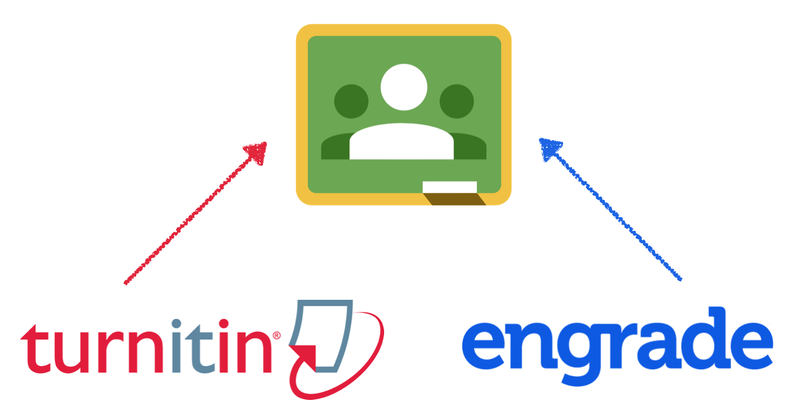 In my classes, I rely on the intersection and interaction between three tools: Google Classroom, Turnitin.com and Engrade. Truth: I’m a fan of all three. Google Classroom lets me seamlessly get assignments/readings into the hands of my students and collect their work. Turnitin.com gives me the ability to digitally grade major writing assignments with state-of-the-art plagiarism and commenting features. Engrade is the mother of all online grade books, allowing my students to check their grades anytime they want using their devices. I understand completely that an essential part of being a 21st Century educator (and student) is having the ability and skill set to navigate the plethora of online tools that are out there, and to develop ways to integrate them into practice in a meaningful way. The key is understanding the process (not always product): how can these tools work together to enhance student learning? When I first started teaching with each of these tools, I made it my mission to use every single aspect of each one, all the time. Guess what? I got overwhelmed. My students got overwhelmed. They got confused. I heard things like “Mr. G, do you want this assignment turned in on Classroom or Turnitin?” “Wait, is our grade on Engrade or Classroom? Are they the same?” It wasn’t working. After a few years dealing with this quagmire of failed productivity, here’s what I’ve learned: use what you need, and only use it if it works for your students. I use Engrade solely for grade book keeping, but not for assignment collection or digital assessments, even though it has that functionality. Classroom is used in my classes for content delivery and collecting and grading smaller assignments, but I don’t use it as my central grade book. Turnitin.com is for bigger assignments and peer editing, but I don’t use it with every writing assignment I assign. I’ve made a custom, fit-for-me plan that works for my teaching practice and for my students. If you need help developing your own plan-of-attack, reach out to your ITS or another digital coach in your school. Most importantly, engage in a conversation with your students about what works for them. When I tried Edmodo a few years ago, I thought most of the features were attractive and complemented my teaching practice and style. However, my students didn’t find it as useful. Don’t misinterpret: Edmodo is a fantastic service that thousands of students use every day. It just happened to not work well for my students. Opening the doors for feedback from the students is a great first step as you develop your approach to using multiple tech tools at once in your classroom. Our students are “digital natives”. They are ready for the challenges and payoffs of a 21st Century education. Our role as teachers should be to listen to what they have to say and take their feedback with more than a grain of salt. I know I’m a better teacher for it.